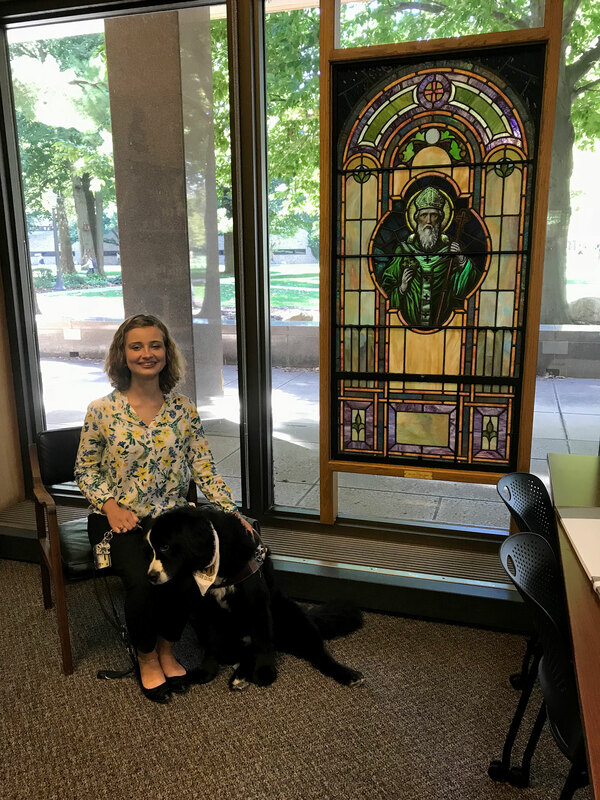 Special Collections has had the pleasure to work with students and their service animals on multiple occasions during the past year. Our first visit occurred last fall. 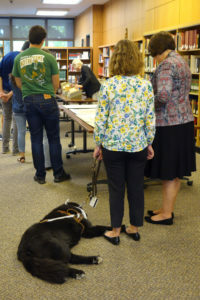 A faculty member inquired about her class’s upcoming visit to Special Collections. She had a student with a service dog and inquired if this would be an issue and what needed to be done. We told her that there was absolutely no problem and that we were excited to work with the student and her service dog. 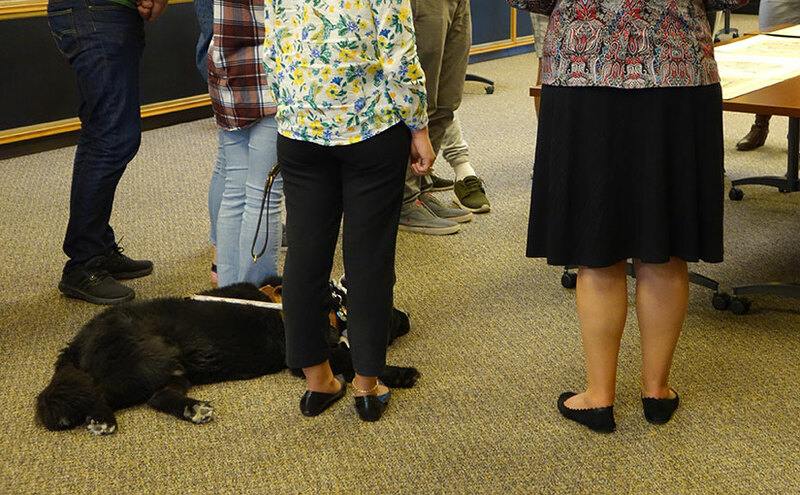 We did inform her, though, that this was the department’s first experience so we were not sure what to expect and would do whatever we needed to ensure the student and service dog had no issues navigating the room. 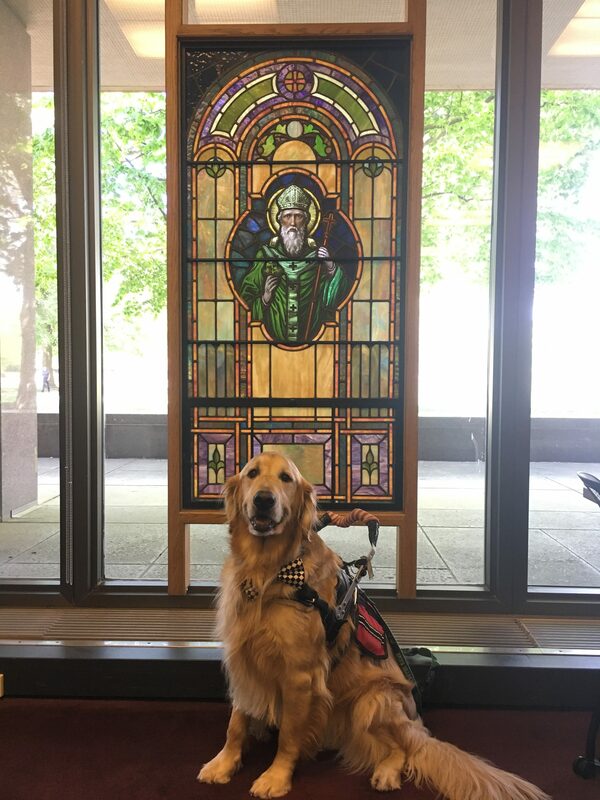 A student in the Honors College and her service dog, St. Patrick (aka Paddy), visited with her class. Paddy assists the student with general mobility, as the student described in an article for Notre Dame’s student magazine, Scholastic. With Paddy at her side, they navigated the tables, making their way through all of the materials with ease. Paddy was even excited to make a return trip to pose in front of her namesake. We then had another student and her service dog come with two different classes, one last spring and another last week. Again, the visits went smoothly. Maddie and Snowbird (right) navigated the tables with the class. Snowbird and I have worked together for a little over six years. The pairing process was quite comprehensive. For the first week of our month-long program, the trainers learned everything they could about us, asking us questions about our habits, walking speeds, and even posing as dogs so that we could practice holding the harness and appropriately instructing the dog. After that, they selected 2 to 3 dogs that seem to match our personalities, and on the first Friday of the program, my six classmates and I had to guess which dog we would be matched with. All seven of us guessed correctly. I have visited Special Collections with two of my classes here at Notre Dame. It’s been an incredible and enriching opportunity! Snowbird typically lies beneath the table in my classes, and I exam in the books and maps pertaining to the subject we are studying. A wonderful aspect of visiting Special Collections at Notre Dame is that I have the opportunity to touch some of the manuscripts and examine them up close. For me, Snowbird is my eyes. Though he unfortunately cannot read the manuscripts to me, he enables me to travel confidently and independently. Guiding the blind is far from the only thing that service dogs can do. They make day-to-day life possible for people with a wide range of physical and emotional challenges, and their presence allows many students like myself to thrive at this great university. Thank you Maddie and Snowbird for sharing your experiences with us. It’s been a pleasure having both of you visit Special Collections. Behind the timing of this post is a question that arose this summer. I participated in a class on teaching with rare materials at California Rare Book School at the University of California, Los Angeles. 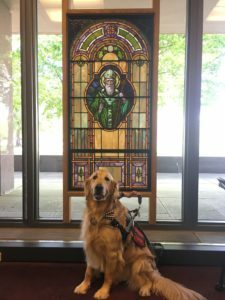 A curator from another institution asked whether anyone had experience working with service animals in Special Collections. To my surprise, no one else in the room of fifteen participants representing departments located in both the US and Canada had experience with service animals accompanying students during classes in Special Collections. Given their interest, all of us in Special Collections at Notre Dame would like share our experiences with the community. A service animal, according to the US Department of Justice’s 2010 revised requirements for service animals, applies only to dogs that are individually trained to do work or perform tasks for a person with a disability. Service animals are allowed in all areas of public facilities where the public, customers, clients, program participants, or invited guests are permitted. More information about service animals can be found on the Americans with Disabilities Act (ADA) National Network website.